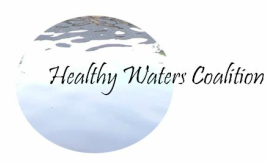 In spring 2012, the founding members of the Healthy Waters Coalition began to gather and exchange information about water resources protection efforts in the Sebago Lakes Region and the issue of future transportation of oil sands in Maine. The coalition's founders began by making reports at town conservation commission meetings (April 2012). Over summer 2012, the founding members put together a webpage of information and attended information forums, before convening official meetings in fall 2012. The coalition's first event took place November 1, 2012--an information forum on oil sands and pipeline issues held at the Raymond Village Library in Raymond, Maine. As of 2013, the Coalition includes representatives from nine different Lakes Region towns: Raymond, Casco, Otisfield, Sebago, Naples, Standish, Windham, Harrison, and Waterford. Members are volunteers and representatives from local government, town boards and committees, local watershed groups, including Sebago Lake Anglers’ Association, Panther Pond Association, Parker Pond Association, as well as other interests, such as Saint Joseph’s College, several local businesses and individual citizens. While the coalition was founded in Raymond, it quickly expanded to include members from other towns and throughout the Lakes Region. The coalition also works in concert with and receives technical assistance from several organizations, including Natural Resources Council of Maine, Association of State Wetland Managers, National Wildlife Federation, Conservation Law Foundation and Natural Resources Defense Council on matters concerning environmental law, policy, wetland and watershed science, wetland/water permitting regulations, and other expertise. The Coalition is a pro-info group. It weighs economic and ecological interests in a watershed context.